Coming from the busy streets near Piazza Navona, we find ourselves a quiet square before the graceful façade of today’s station. Originally the liturgy of today was celebrated in the church of St. Tryphon. This was an older church which once stood near here but was demolished to make room for the adjacent Augustinian convent, which was later confiscated by the Italian government after the invasion of Rome in 1870. The church of St. Augustine, under the patronage of the great pastor and author of the fourth and fifth centuries, dates back to the medieval period, with the first church begun in 1296 and construction continuing over the following two centuries, finishing in 1446. Soon after, this was almost completely rebuilt as the present structure, beginning in 1479 and completed in 1483. 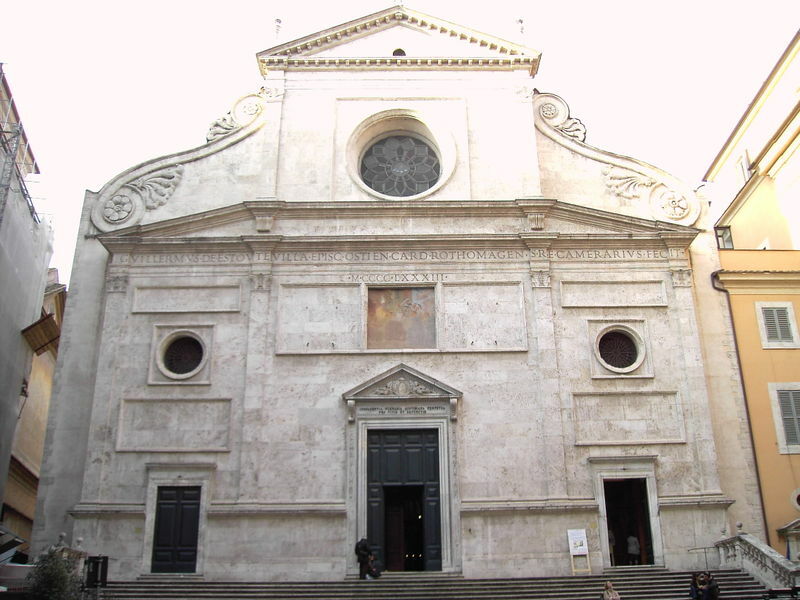 While the exterior appearance still asserts the Renaissance origins of this church, the interior modifications began almost as soon as it was completed. The pillars of the nave were covered with frescoes in the mid-sixteenth century; the high altar, a work of Bernini, was constructed in 1626-28. A more general renovation took place in 1750 and again in 1860. Through all of these changes the interior has maintained its order and proportions, reminding us of the age in which it was built when the new intellectual ideas of the Renaissance were spreading throughout Europe.